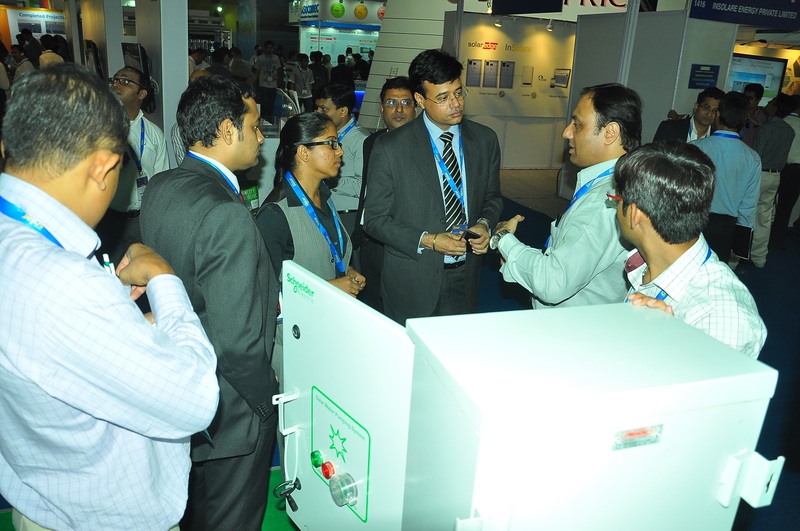 Intersolar India 2013, the largest expo on Solar Industry, took place at Mumbai in November. It is part of the series of trade shows on solar theme held every year in China, Europe, North America, South America, besides India. The event attracted many visitors and afforded a wide-angled view of the Indian solar scenario. 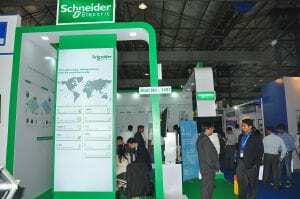 Schneider Electric India showcased its Solar Business Offer in the 3-day exhibition. Being a tropical country, sunlight is plentifully available in India for long duration and in high intensity. Solar technology therefore has begun to be deployed as a safe, efficient and cost-competitive option. Coal, with all its adverse ecological footprint, is not a sustainable answer and is also set to get more and more expensive in world markets in the times to come. India launched National Solar Mission in 2010, branded as “Solar India”, to set up a mega target of 20,000 MW (20 GW) of grid-connected solar power by 2022 with an enabling policy framework to make India a global power in solar energy. Evidently, the country harbors grand solar ambitions in the face of burgeoning power deficit and a complex power sector. India is slated to add about 1.4 GW installed solar capacity in 2013, more than the combined figure for three preceding years. Though the government has professed its policy to deploy solar thermal and solar PV technologies on 50:50 ratio, solar PV (1.2 GW operational and 1.6 GW under development) has taken a big lead over solar thermal (5 MW installed and 550 MW under development). (Figures courtesy: Mercom Capital Group, IIc). 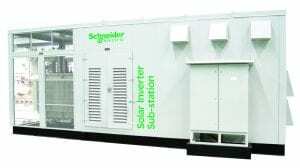 Schneider Electric has, so to speak, made hay as the sun shines, with its top-of-the-line solar offer of solutions for end-to-end electrical distribution. 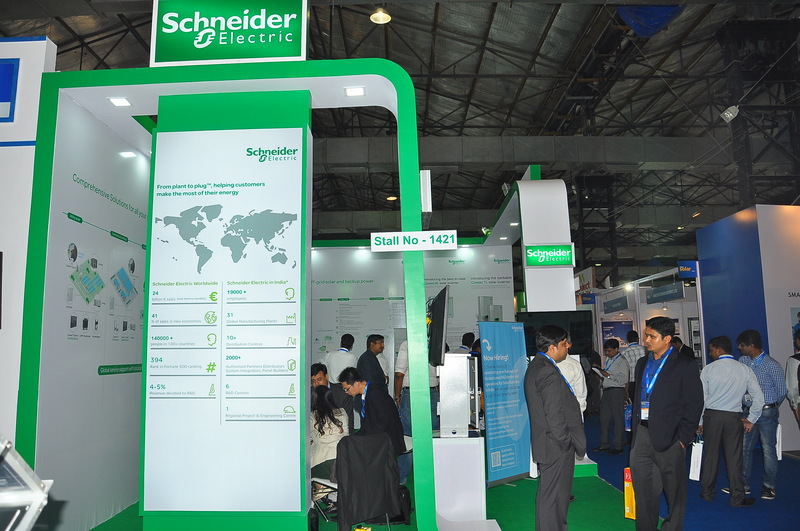 Projects of over 300 MW are under execution in India with Schneider Electric solutions. There is much more capacity to be catered to as India widens its solar vision. The grid-tie and off-grid solar solutions have been widely implemented at PV power plants, commercial and different types of installations. For a large solar power utility, an integrated ‘Plug N Play’ PV Box power conversion solution, along with Solar XC Inverters, Array Boxes, SCADA Monitoring Modules, matching MV & LV Switchgear, makes the installation score high on security and performance. This containerized solution has set a high benchmark in the Indian solar landscape. The “made-for-India” version of the substation has created quite a niche in the market. The Solar Water Pumping System, ranging from 1 to 7.5 HP motor rating, drew keen interest in the exhibition. Housed in a pre-wired enclosure and equipped with an advanced ATV312 solar drive, the solution promises to be popular in Indian context, providing water at affordable cost to people with negligible or no access to electricity. Solar technology has unleashed the power to harvest the golden rays of the sun into electricity to drive development – in a way that is Green, Clean, Efficient, Safe and Sustainable. And India has stepped on technology to set off on its solar mission. The initiatives set forth by Schneider in India are commendable, products are highly reliable but at the same time, costing makes a big dent. Everyone understands quality commands price but then how can an active platform be derived, where all the stakeholders are standing on an even ground. Quite a moot point, Bhavesh. The Indian solar panorama is witnessing dynamic trends though – decreased costs of solar panels along with their improved productivity have made solar power more and more attractive in India. As per Central Electricity Regulatory Commission (CERC) of India, the PV System cost dropped from 17 crore rupees (3.2 million dollars) per MWp in 2009 to 10 crore rupees (1.8 million dollars) during 2012-13, with PV modules constituting over 40-50% of the cost. The average power tariff realized (Rupees 8.80 per kWh) has also been remarkable as against the reference price (Rupees 17.91 per kWh) set by CERC. All this augurs well for intensive adoption of solar technology in India. Of course, there are other aspects of cost like land, civil works, inverters and electrical systems, operating expenses like insurance, project management, financial costs etc. Schneider Electric caters to the entire spectrum of end-to-end electrical distribution for solar power – Solar Inverters, Array Boxes, Compact Station PV Boxes, Monitoring Syatems, MV & LV Equipment and Accessories etc. – for PV power plants, large commercial buildings, grid-tie as well as off-grid applications.